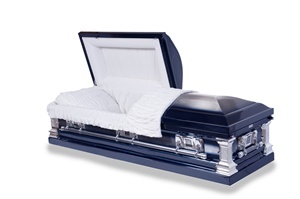 When you are wanting a look of elegance, choose a stainless steel casket. Stainless steel is an extremely durable metal and is the perfect way to remember your loved one. Feel free to browse through our collection of metal caskets and contact us if you need assistance. At Fast Caskets, our selection of funeral caskets includes a line of beautiful stainless steel caskets. Our Victoria Casket comes in a feminine, ice rose finish and has a plush pink velvet interior. Or try our Liberty Casket. This stainless steel casket comes in a brushed, natural dark blue finish. The casket also has a continuous weld construction, which completely seals the bottom, so you know you’re getting a heavy-duty casket. For something more stately, go with our Regal Casket. 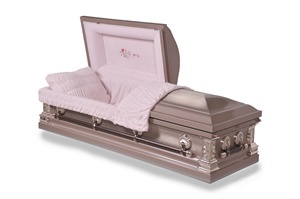 This casket has a stunning, platinum finish and intricately designed squared corners. The white velvet interior is the perfect finishing touch.